All cakes are custom designed and created for each customer so there is no set price, however please see below for an approximate guide. Please note square and novelty shaped cakes cakes carry a higher cost and some flavours are subject to a surcharge – specifically mud cakes. The minimum size cake available as a standalone order is 6″ and therefore the minimum order amount for an undecorated cake is £50; smaller sizes are only available as part of multiple tier orders. All cakes are individually priced on request, based on nature, size and intricacy. This guide is based on plain buttercream iced cakes with a standard depth of 4.5 inches. Please note other sizes can be made – please email for a quote. Multi-tiered cakes carry additional costs and are priced on request. Double barrelled cakes (one cake: two ways!) provide either standard height or shorter slices depending on your requirements and may be more suitable for children’s celebration cakes, where only smaller portions are needed. These cakes are priced according to how they are tailored. Cake toppers are priced individually. All cakes are bespoke to each client. It is not possible to copy another company’s design without permission, but please do send photos to use as inspiration when creating your design. These portion estimates are conservative. Please note portions may vary depending on how a cake is cut and all numbers given below are approximate. 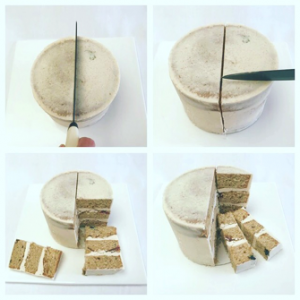 Please see below for a guide to cutting a round cake. Be sure to follow me on Instagram to stay up to date on my latest cakes! Please ensure you have read my terms and conditions when placing an order. Orders are based on collection from Leatherhead, near Ashtead. Close to Cobham, Epsom, Dorking, Oxshott, Esher and within easy reach from Guildford and Kingston upon Thames. Delicious custom edible art cake centrepieces for your special occasions, based in Surrey. Contact me to book your special birthday cake, anniversary cake, christening cake, wedding cake or something just for fun!